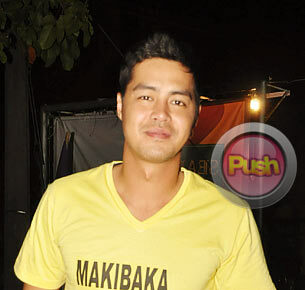 Zanjoe Marudo wants to make sure that he won't have to leave 'Banana Nite' when he gets other projects. Zanjoe had to leave Banana Split when he did Kristine Series in 2010 because of the conflict in schedule. He came back to Banana Split in January 2012. This time, Zanjoe said that he will try his best to fix his schedule so that he will not have to leave the gag show again. The actor revealed that the script for his next teleserye is still being modified. He is slated to team up again with Angel Locsin, whom he worked with in last December’s One More Try. He admitted that he is looking forward to working with Angel again since they will be working on a teleserye this time. As for movies, Zanjoe confirmed that he will do a movie but didn’t go into details. “Ito na ‘yung masasabing pinakamalaking project na magagawa ko,” he said smiling. “Kini-claim ko na launching ko ‘yon. Ano pa lang, eh, inaayos pa ‘yung makakasama ko at magdi-direk, pero may istorya na.” He added that the movie is slated to come out this year.